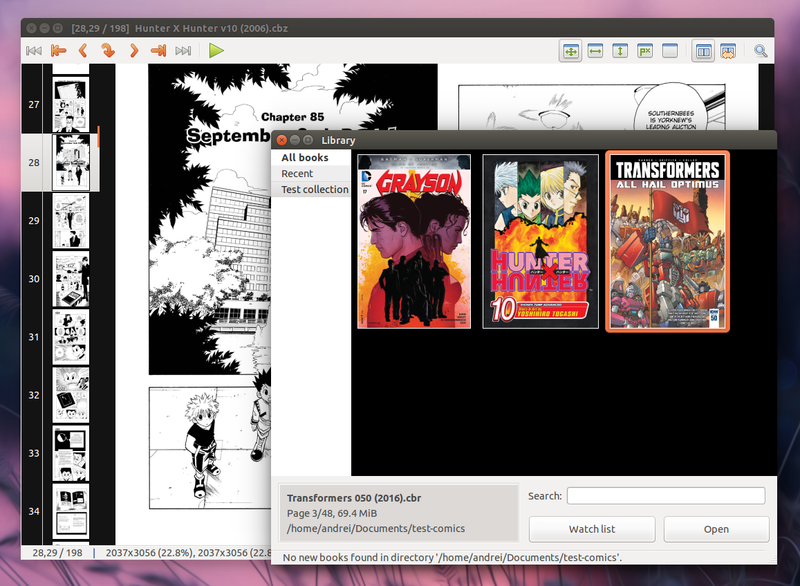 MComix is a versatile comic book reader that supports both western comics and manga, in a variety of container formats, including CBR, CBZ, CB7, LHA and PDF. The application is available for Linux and Windows. Initially started as a Comix fork (app for which development stopped in 2009), with the main purpose of adding bug fixes and stability improvements, MComix has evolved over the years, gaining new features and various improvements, and becoming a a solid comic reader. many other minor but useful features like a magnifying lens which you can use to zoom in to a portion of a comic, etc. It's important to mention that while the application can open animated images, it won't play them and you'll be looking at static images instead. There is an open bug regarding this, with no answer from the developer yet, so you can keep an eye on it if this is something you're interested in. 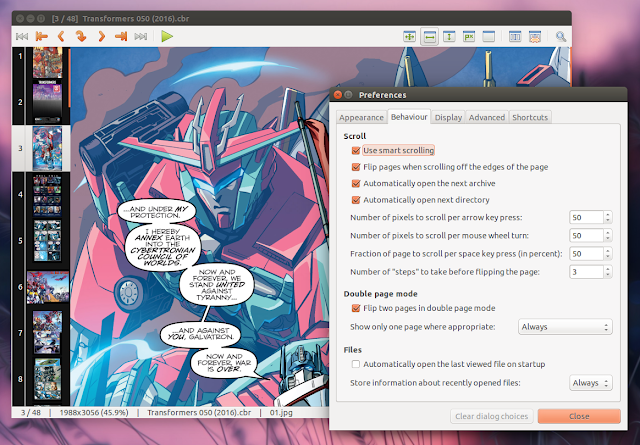 The MComix package from the official Ubuntu repositories hasn't been updated in a while (Ubuntu 15.10 provides MComix 1.00, while the latest version is 1.2.1) and I couldn't find the latest version in any PPA, so I decided to upload MComix 1.2.1 to the main WebUIpd8 PPA, for Ubuntu 14.04, 15.04 and 15.10.
double page mode respects Exif rotation now. To download the source or Windows binaries, see the MComix SourceForge downloads page.